The Fatima Centenary India Tour that began from Fatima in Portugal had a halt at Miao in Changlang District of Arunachal Pradesh on 22 October 2017. Fatima, a small village in Portugal became very popular after the apparition of Mother Mary to three shepherd children between May and October 1907. This is the 100 year since this Marian apparition. To celebrate this event and to promote devotion to Our Lady of Fatima, the Santavana Community from India in collaboration with World Apostolate of Fatima has arranged a tour to one place in every State of India with the statue of Mother Mary blessed by the Bishop of Fatima. Miao became the privilege place in Arunachal Pradesh to have the visit of this Fatima Tour on 22 October. “I feel so blessed to have the visit of Our Lady of Fatima to our village”, said Miss Rose Mossang of Miao Parish. The statue of Mother Mary was received first in Miao in the morning and then at Kharsang town, 20 KMs away, in the evening. The threat of rain did not deter the people from coming in large numbers. 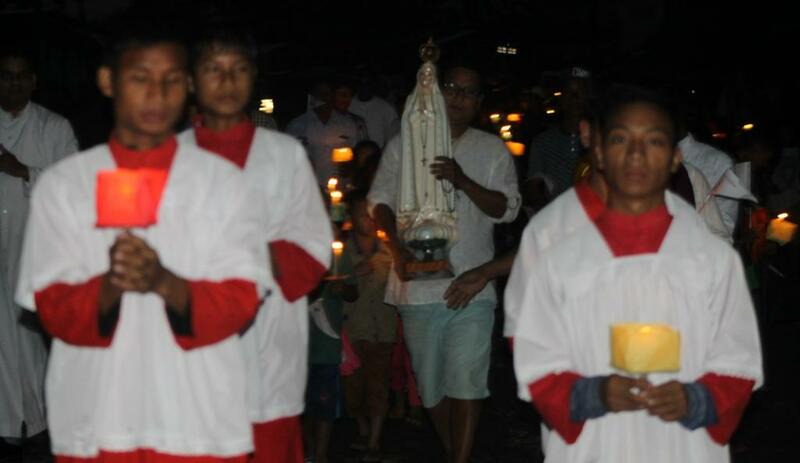 There were more than 500 people in the Rosary Procession that started from Kharsang town and ended at Krick and Bourry Memorial Hospital at Injan with solemn Eucharistic Adoration. “The rain stopping for us during the procession is clear sign of God’s blessing and Mother Mary’s prayer for us. It would have been difficult for us, had it rained”, said Mr. Tumen Mossang from Old Plone village.